One of the great American iconoclasts holds forth on politics, war, books and writers, and his personal life in a series of conversations, including his last published interview. During his long career Kurt Vonnegut won international praise for his novels, plays, and essays. 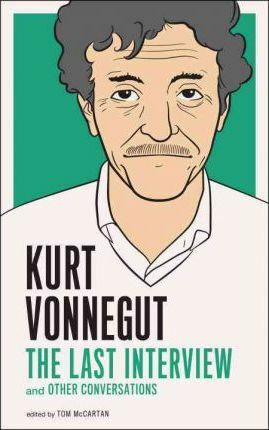 In this new anthology of conversations with Vonnegut--which collects interviews from throughout his career--we learn much about what drove Vonnegut to write and how he viewed his work at the end. Is there another book in you, by chance? No. Look, I'm 84 years old. Writers of fiction have usually done their best work by the time they're 45. Chess masters are through when they're 35, and so are baseball players. There are plenty of other people writing. Let them do it. So what's the old man's game, then? My country is in ruins. So I'm a fish in a poisoned fishbowl. I'm mostly just heartsick about this. There should have been hope. This should have been a great country. But we are despised all over the world now. I was hoping to build a country and add to its literature. That's why I served in World War II, and that's why I wrote books. When someone reads one of your books, what would you like them to take from the experience? Well, I'd like the guy--or the girl, of course--to put the book down and think, "This is the greatest man who ever lived." "Like Mark Twain and Abraham Lincoln, even when he's funny, he's depressed. . . . The way he goes about his business has helped most of us to go on living, if only to find out what happens next." "He is a satirist with a heart, a moralist with a whoopee cushion, a cynic who wants to believe." "Vonnegut is our strongest writer . . . the most stubbornly imaginative." Kurt Vonnegut's black humor, satiric voice, and incomparable imagination first captured America's attention in The Sirens of Titan in 1959 and established him as "a true artist" (The New York Times) with Cat's Cradle in 1963. He was, as Graham Greene declared, "one of the best living American writers." Vonnegut died April 11, 2007.